I am glad when people like Passenger, but it annoys me a little bit when think it's a band. 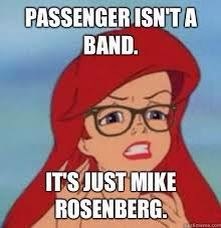 I know (and Mike knows :)) it's a little confusing but... Even if the media or places where Passenger's concert take place invite people to see a talented band called Passenger. What? Can they just got their information right? (Yeah, I'm little bit guted with Sasazu after I read their tweet, yeah but I still love them for having Mike there in October) They could just google a minute and they would realise it (if they already hadn't knew that).